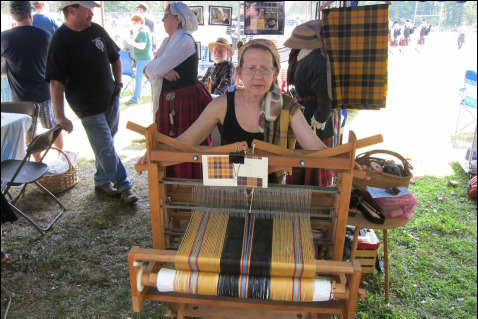 Near the main field, across from the St. Andrews Society tent, watch expert weaver Kathy Wells and her helpers as the practice the ancient art of weaving. Learn how the intricate patterns on the Scottish Tartans are created and crafted, a process starting with raw wool and progressing through to the famous Highland Kilts. 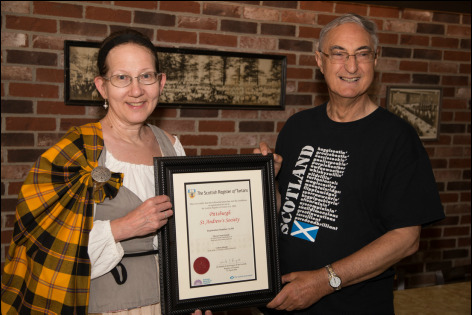 Kathy Wells is the creator of the Pittsburgh St. Andrews Society Tartan, now registered in the official Scottish Register of Tartans. A tartan is a distinctive and unique pattern that proclaims the identity of the bearer; it may relate to family or clan; it may represent a regiment; it may indicate a place of origin, residence or birth; or it may commemorate a specific event. Pittsburgh as a city has never had a designated tartan. William Pitt’s black and gold coat of arms was first transferred to the Pittsburgh city flag in 1816. Since then the three major Pittsburgh sports teams: the Pittsburgh Steelers, the Pittsburgh Pirates, and the Pittsburgh Penguins, have all adopted these same colors for their teams. Black and Gold has come to be synonymous with Pittsburgh. 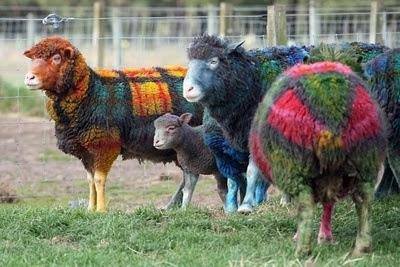 Thus Black and Gold are the primary colors for this tartan. Pittsburgh was named by a Scot (General John Forbes), and keeps its Scottish spelling with the “h”. It was developed into “the Steel City” by another Scot (Andrew Carnegie) as reflected by the tartan. The logo of US Steel, now USX, once Carnegie Steel, bears 3 hypocycloids (diamond shapes with concave sides). Each hypocycloid is a different primary color: red, yellow and blue. Originally these colors were said to represent how the steel industry improved life; Red brightens your leisure, yellow lightens your work, and blue widens your world. A later interpretation says they represent the primary ingredients for making steel; red for iron ore, yellow for coal, and blue for steel scrap. These colors, woven into the black and gold, are a tribute to the industry that built Pittsburgh. Geographically, Pittsburgh is located at the confluence of the Monongahela and Allegheny Rivers, which come together at the Point to form the Ohio River. This design has three blue stripes, one of which is on the pivot point, where the design reverses, bringing the blue stripes together as one. This tartan, designed by local resident Kathy Wells, is being copyrighted and presented to the Pittsburgh authorities, to be registered as the Pittsburgh tartan with tartan authorities in Scotland. Until relatively recently, it was assumed by most historians, academics and commentators that tartan was a Johnnie-come-lately . . . a modern invention by rapacious 19th & 20th century weavers and city merchants eager to swell their coffers. Rumors abounded of much earlier origins but it wasn't until American textile archaeologist Elizabeth Barber thoroughly investigated the Mummies of Ürümchi that the real truth emerged - backed up by impeccable archaeological proof.When the earliest of these Central Asian corpses was laid to rest in the sands of the Tarim Basin, about 2000 b.c. or a little after, the Chinese had not yet learned to use metal but were already busy domesticating the precious silkworm that would one day lend its name to the most famous caravan route of Inner Asia, the Silk Road, along whose stretches the mummies have been found. The mummies appeared to be neither Chinese nor Mongoloid in facial type; they looked "Caucasian," with high-bridged noses, deep, round eye sockets, fair hair, and - on the men - heavy beards. . . . . historians would not particularly expect Chinese mummies in Central Asia in the second millennium BC but why not Mongoloid? Archaeologists and linguists alike had assumed that the Mongol-type peoples had "always" inhabited this entire area . . . . they also assumed central and northern Asia to be the general homeland of the Altaic linguistic group, which today includes Mongol and the various Turkic and Tungus languages . . . to find Caucasians was a surprise. Outside of Egypt you find a presentable piece of cloth in a prehistoric dig about as often as you find a ruby in your oatmeal. Yet here, and for the same reason as in Egypt, ancient textiles come out of the ground by the armful. Whereas the sophisticated Egyptians labored to produce masses of plain white linen, the country folk of the Tarim Basin wove and bedecked themselves in garments of vivid color that has survived with astounding brightness. 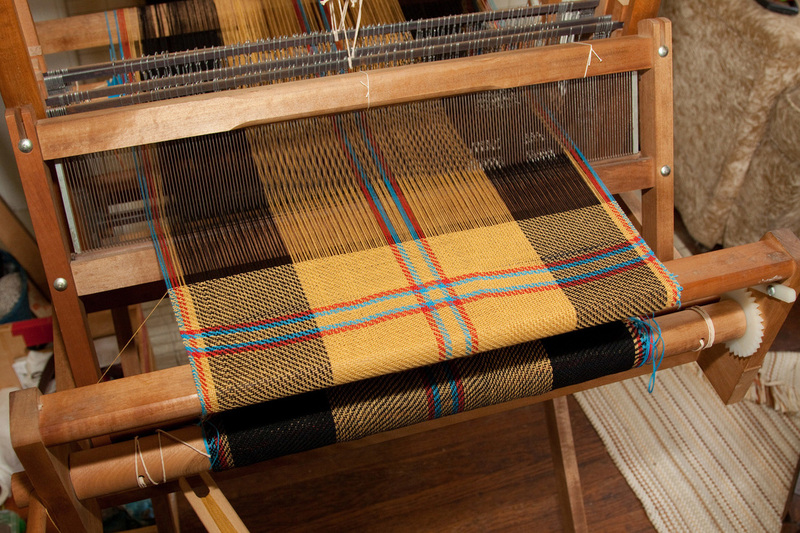 The dominant weave at Qizilchoqa proved to be normal diagonal twill and the chief decoration was plaid - that is wide and narrow color stripes in both warp and weft, as in the woolen twill material of a Scottish kilt. And there lay the big surprise. The Gaelic-speaking Scots, along with the Irish, Welsh and Bretons, belong to the Celtic branch of Indo-European; and the Indo-European family tree, when organized by dialect similarity rather than modern geography shows Tokharian on the branch next to Celtic. Wang Binghua's wife, Wang Luli, also published a piece of plaid twill: a large portion of some sort of vest. Her photograph shows broad stripes of purple-brown thread with the plaid formed by pinstripes in no fewer than five other colors: light and dark blue, red, white, and black. To make the vest, the tailor joined pieces of this stuff together with pale blue yarn, edged the vest with two narrow plaited cords, and added a pair of buttons covered with the same pale blue yarn. That sample has been rewoven in modern times and offers a remarkably sophisticated design that is the equal of many asymmetric tartans of the 20th century.